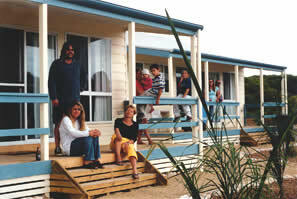 Comfortable, medium, economical, fully self-contained holiday accommodation to enjoy with family and friends. There are 2 two-bedroom units that each sleep five people. Open living area with a fully self contained kitchen including  oven and hotplates, microwave oven and fridge/freezer. Living area has two sofas, TV, VCR and videos, and stereo with CD player. Two bedrooms  one with a double bed, and the other with a single and double bunk. All beds have quilts and pillows. Outside verandah and decking with table and chairs. Each unit has a carport.